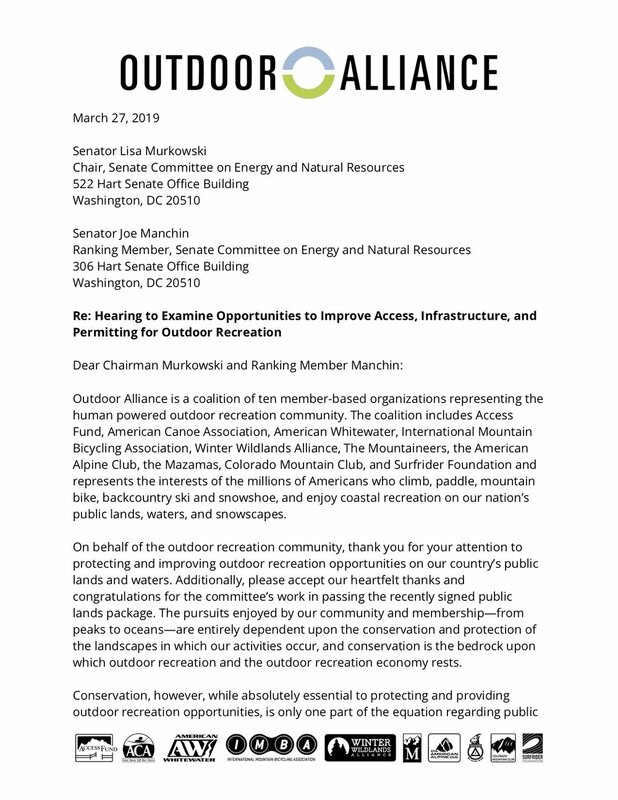 On March 14, the Senate Energy and Natural Resources Committee held a hearing on opportunities to improve outdoor recreation on public lands (it was officially titled “Full Committee Hearing to Examine Opportunities to Improve Access, Infrastructure, and Permitting for Outdoor Recreation” and you can watch the full hearing here). This hearing was just two days after the President signed a historic public lands package into law, the John D. Dingell, Jr. Conservation, Management, and Recreation Act (see it here). Recreation is an increasingly important use for public lands, yet it gets a fraction of the protection and priority that other uses, including extraction, receive. The hearing explored opportunities to improve management of public lands for recreation, updating the permitting system, building better infrastructure and funding for public land, and growing the protection of important places. Thomas O’Keefe, the Pacific Northwest Stewardship Director at American Whitewater and a member of Outdoor Alliance’s Joint Policy Shop, was among those invited to testify. One of the biggest infrastructure challenges for public lands is a lack of funding from Congress. “Increasingly we are facing chronic underfunding of resource agencies to develop and maintain basic infrastructure necessary to access our public lands and waterways. Unmaintained trails, roads, and facilities fall into disrepair, diminish user experiences, and create public safety issues; ultimately the capital expenditures necessary to address the issues and bring facilities back to standard can greatly exceed the cost of what annual routine maintenance would have been and is fiscally irresponsible. In my work, finding resources to build a river access or recreational facility is challenging but being able to commit to or have stable long-term funding to maintain and manage a facility is often an insurmountable obstacle,” said O’Keefe. Members of the committee, including committee Chair Sen. Murkowski (R-AK), Ranking Member Joe Manchin (D-WV), and Sen. Wyden (D-OR) were instrumental in passing the public lands package, and have been champions of outdoor recreation and conservation issues both in their states and across the country. As recreation grows in popularity and as recreation on public lands becomes increasingly important to local economies, there is more to be done to maximize opportunities for sustainable recreation and balance the needs of conservation. You can view O’Keefe’s full testimony by clicking at right or here, and you can view Outdoor Alliance’s full testimony by clicking at left or here. You can also view Access Fund’s full testimony by clicking here and American Alpine Club’s testimony here.